Social Media is a must in your Digital World, but who has the time to keep up? Doing Social Media correctly takes time and knowledge. Doing Social Media wrong is a total waste of valuable time that is better used building your business. Our expert Social Media team can provide you with the help, guidance, and knowledge to do Social Media correctly. Does it seem like there are not enough hours in the day? 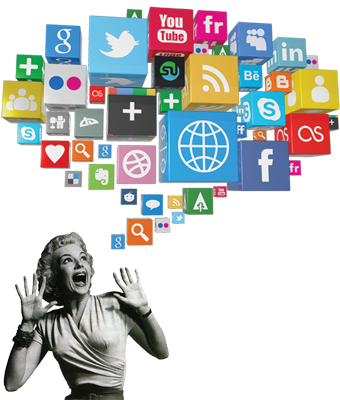 Let our team of professionals lift the burden and manage Social Media, and get results for your business. Social Media is a must have in your digital marketing program but who has the time? It does take time, and it takes knowledge! If you are not using your Social Media channels correctly, you are just wasting all that valuable time. Businesses waste hundreds, sometimes thousands of staff hours a year doing Social Media wrong. Are you checking your analytics? Do you know what and when you should be posting for the results you want? Are you wasting money on Facebook advertising and not getting results? You are not alone; most businesses have no idea what they should be posting when they should post it for maximum results or how to reach and grow their audience organically. Companies waste hundreds, sometimes thousands of staff hours a year doing Social Media wrong. Let our Social Media Experts get your program on the right path to results. Our Social Media Services include everything from your account set up and page design to content creation, copywriting and posting. We understand the analytics, and we know how to make Social Media work for you without spending thousands of dollars on advertising. If you just need a little help or you need complete social media management, contact us today, and we will help get you on the path to social media success. Even if you are outside the Schuylkill County area, we can still provide Social Media Services and content creation. Contact our Social Media Professionals to discuss your Social Media goals. Blogging, tweeting, posting, it all takes time, and it all needs to be done correctly to get the results you want. Professional writers in our group can provide premium content for your blog, Facebook page or Twitter feed. You can purchase content services a la carte or in bundled packages designed to fit your specific goals. We also provide the essential keyword research needed to make your Social Media content count. Contact our professional copywriters today to discuss your content creation requirements. Not too many professionals would dispute the need for a blog. As a matter of fact, a blog may be the one most important thing you can do to improve your search and traffic results. A blog, when done correctly, is a way to build up evergreen content that is rich in keywords to help your search ranking and rich in content to both please your visitors and build your online reputation as an expert in your field. The key is that you must blog consistently and you must carefully construct your blog posts to include the search terms that you need in order to attract your target audience. Blogging and creating content is a big job, but it may be the best bang for your buck for driving traffic to your website.